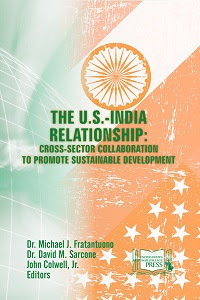 Overall, the entire publication addresses the increasing need on the part of strategic leaders from all sectors to better understand the factors that contribute to the success of collaborative initiatives, all of which are relevant to the efforts to promote sustainable development in the context of the U.S.-India strategic relationship. To learn more, the entire publication is available for download at the U.S. Army War College’s Strategic Studies Institute. Fratantuono, Michael J., David M. Sarcone, and John Colwell. The U.S.-India Relationship: Cross-sector Collaboration to Promote Sustainable Development. N.p. : n.p., n.d. Print.